Because Fire Pits Need Protection, Too! You may think that your outdoor fire pit could take on the outdoor elements with a fearless resolve, but after seasons of exposure to direct sunlight, moisture, wetness, insects, animals and more, it’s going to start to degrade in both form and function. Regular application of the Fire Pit Cover by PCI will prolong the life of an outdoor fire pit. Many people choose to fashion a cover out of a leftover tarp and zip ties, but this frequently does the opposite of the intended. It traps in moisture, bugs and more. 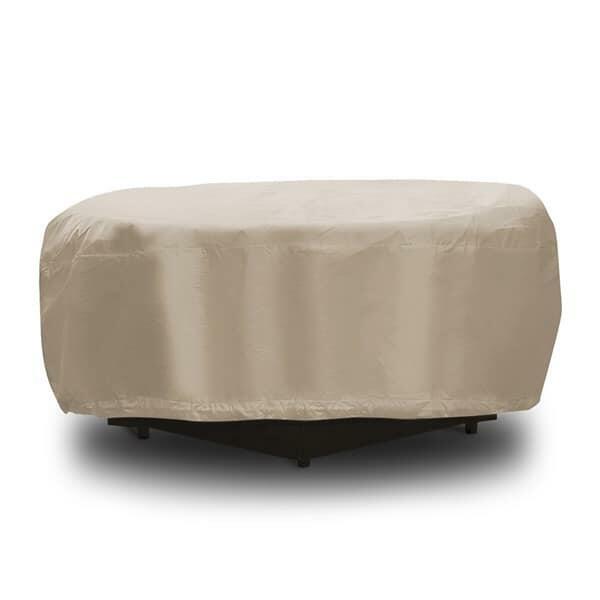 The Fire Pit Cover by PCI is designed to truly protect. The vinyl outing is 7 millimeters thick and is treated to protect against water, UV rays and more. The inside is a fleece sheet that is compressed and laminated onto the vinyl. The two-part protection provides unsurpassed protection to fire pits, whether for one night, one season or an entire year.